A while ago I was heavily into reading Japanese writers, exploring a wide range of books from that country from The Tale of Genji to In the Miso Soup. I discovered a great love of Japanese fiction. There’s a sparseness to it, even in its most glorious excess (Miso Soup is extremely violent) which allows the reader space to reflect. Themes of loneliness, isolation; the unspokenness of life. These are all themes that draw me in. No wonder I still feel a frisson of connection when I see a Japanese name on a book. I bought a lot of books by Japanese writers, borrowed more, and I read most of them but there are still a handful languishing on my shelves unread. For some reason The Three Cornered World was one of them. I’m not sure why. I’ve read Kokoro by Soseki and thought it delicate and under-stated, yet somehow I never managed to get around to this one. Perhaps I had to be in the right mood. I was definitely in the right mood. In the blurb on the back of my copy the book is described as an ‘exquisite word painting’ and I can’t think of a more appropriate description. It is at once beautiful, strange, delicate and bold. It is like a work of zen art – simple, bold brushstrokes suspended in empty space. It is entrancing. “I suppose you could say that an artist is a person who lives in the triangle which remains after the angle which we may call common sense has been removed from this four-cornered world. There is not so much of a story in The Three Cornered World, rather I would describe it as a series of encounters. A young man, an artist, goes on a trip to stay at a mountain hotel intending to create art in the process. Along the way he muses about art, how art is formed, the bones of its creation. “Approach everything rationally, and you become harsh. Pole along in the stream of emotions, and you will be swept away by the current. Give free rein to your desires, and you become uncomfortably confined. It is not a very agreeable place to live, this world of ours. The hotel he chooses to stay in is empty, a little run down, not expecting guests. During his time there he becomes intrigued by the owner’s daughter, a divorced woman with a bad reputation, who behaves in an unseemly way which, as it turns out, is just one of those uncomfortable situations in which art can be formed. His encounters with her are strange, filled with a mysterious significance, always unsatisfactory and brief. He sees her at a distance in her wedding dress. In his notebook he writes a series of poems inspired by her, and she replies. She joins him, briefly, in the bathhouse. There is no sense of romance, rather it is more of a recognition – the daughter is a strange, artistic soul seeking expression. She may be lost in the emotional current herself, but as fodder for the artist she is perfect. Aside from the daughter our protagonist spends time with her father – a man who collects beautiful objects – and a zen Buddhist monk. There is also a nephew who is being sent to fight in Manchuria, and whilst his story is brief and barely touched upon it serves as an interesting counterpoint to the artistic mind, the man who wafts with no object, barely touching his paints, juxtaposed against this boy who is likely going to his death, willingly and without doubts. The Three Cornered World is a strange and exquisite book. It reads almost like a diary, the musings of Soseki on the subject of art. At times there is a sense of superiority – the idea that the artistic mind is the ultimate elevation – and these moments jar a little because in all other respects this is a delicately drawn book, subtle and expansive. Yet these jarring moments do not spoil the book, they make it more real. There’s a sense that there’s a real person, a bold force, behind these haiku-esque musings. 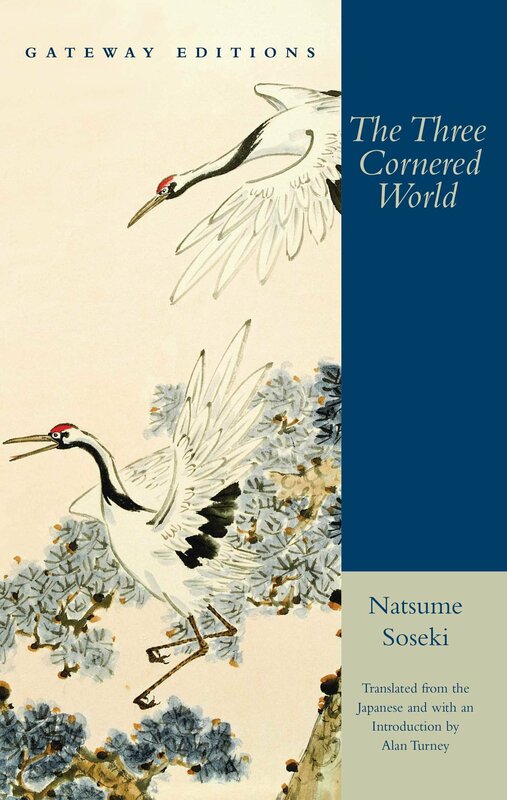 When I finished reading The Three Cornered World I was left with a sense of something unspoken, difficult to articulate. It is a gorgeous read. There is great beauty in it, but also a great deal of philosophical thinking. It left me with a great deal to think about. Each line feels crafted, but not in a unsettling way. It is like looking at a painting and then looking at it again and finding something different each time, something you hadn’t noticed. There’s a gentleness to it, and a boldness. It is many things and no things. Like mist over mountain landscape, it obscures and reveals. I keep lingering over that description ‘an exquisite word painting’ and I think it is definitely true. Yet it is more than that. It is not just a painting, it is life. This entry was posted in Art, fiction, Japanese, The Ideal Reader. Bookmark the permalink. Beautiful review, Belinda. I really liked Soseki’s The Gate when I read it a year or so ago, and it certainly had that sense of isolation and alienation you mention in your opening to this piece. At the risk of sounding a bit shallow, I love the cover of your edition of The Three-Cornered World. It seems a perfect match for your description of the book. Thanks Jacqui, not at all shallow 🙂 the cover is gorgeous and definitely a fine match for the book. I’ll have to read The Gate at some point. Thanks Juliana. It took me a while to come back to Soseki as well. I got more out of this book than Kokoro, though I think Kokoro might be a more cohesive story. This one is a little odd, but also quite beautiful. This sounds wonderful, and your writing itself meets the qualities revealed in the excerpts. I think you were the ideal reader! I’ve requested this book through our inter-library loan system and am looking forward to the read. I agree with all those who clicked the like icon and all those who commented that this was a wonderful review. I also loved Jacqui’s comment about the beauty of the book cover. To treasure beauty is, I think, no small thing. I really hope you like it Jan, I’d love to hear your thoughts once you’ve read it. Gorgeous review. I’d never even heard of this writer, and the way you described the book, I imagined it being more recent than it is. Thanks 🙂 It is a lovely book.